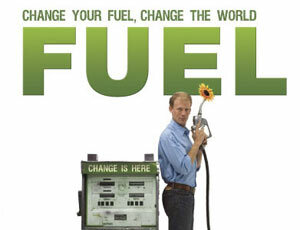 Green SoCal: Free 'Fuel' on Hulu! Online video portal Hulu is currently screening the 2008 documentary "Fuel," about our transition to renewable energy with an emphasis on algae-based biodiesel. Director Josh Tickell has made a moving film about his personal journey into the destructive legacy of our addiction to oil and the green light at the end of the tunnel that will help save our planet for future generations. "Fuel" won the Audience Award at the Sundance Film Festival and having just watched it I give it a big green thumbs up. Perhaps the most touching part of the film to me was its profile of New York City's efforts to produce clean homegrown energy in the wake of the September 11th terrorist attacks on the World Trade Center. Many reasonable people were unsure if NYC could ever recover from such a devastating blow. But the Big Apple is reinventing itself with renewable energy and in doing so is renewing the spirit of this great city and in turn this great country. So it is my pleasure to present to you "Fuel." Will Beverly Hills Residents Block Subway?